We’d been looking for a place in the country for a few years… from the Otways to the Strezlecki’s but without success. We even went to a workshop to learn about building a straw bale house. Luckily we found our place in the bushlands before those skills got road tested. An old friend from Castlemaine knew our Lot was up for sale and suggested we visit… a fortnight before it’s scheduled auction. We were attracted immediately: 7km from Castlemaine on the recently upgraded trainline to Melbourne; in the bush but close to a decent sized regional town; off-grid; and with plenty or room for friends to stay. 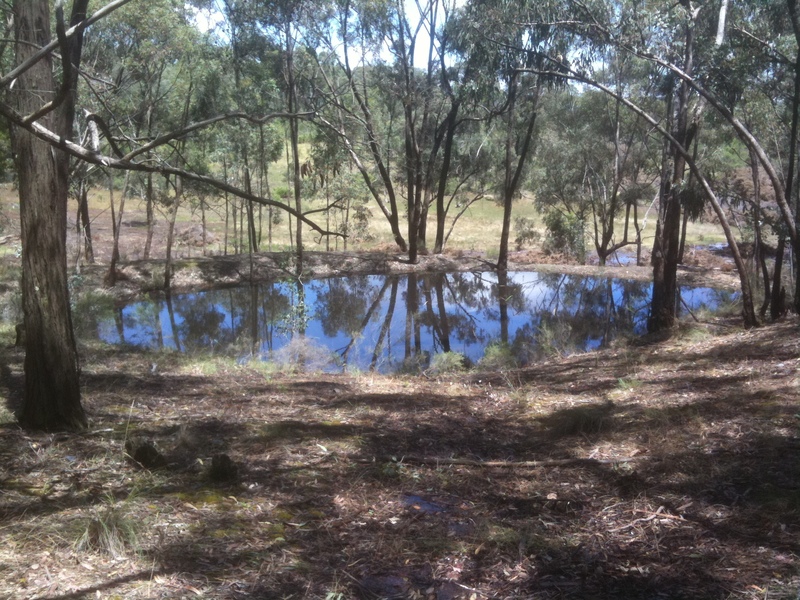 Our Lot sits on the edge the Bushlands abutting cleared land on its southern boundary. A rocky hill (smaller than its neighbours) rises in the middle of the block surrounded by gold dust wattle, coffee bush, stringy bark and box, all managing to thrive in rock hard mudstone, clay, and a bit of granite falling away on all sides (allowing only as much garden as we chose to create). The north facing house is protected from stronger winds at the level of the tree canopy and has views over the distant canopy to the north west. The block changed hands quite frequently before sculptors and metal workers, Michael and Shona designed and built our home. Brian Parsons, the original owner and sub-divider of all “bushlands” blocks, sold our Lot in June 1980 to Ian and Lynette Protheroe. In July 1986 Ivan and Julie Muhar bought it from them. Then they sold to Julianne Hallinan in December 1988. Michael Cartwright and Shona Nunan then bought the block before selling to us in August 2007. We couldn’t have anticipated how this place would change our lives. It’s given us space to slow down, to share time with neighbours, to rub up against nature and to make things. But then, it’s also been a steep learning curve attempting to find some answers to those endless questions: How does a water pump work? What’s the least exhausting way to chop firewood? How easy is it to blunt a chainsaw? Is it really possible to cook things evenly in a wood combustion stove? How much sun does it take to heat the water for a shower? Did spilt battery acid burn those holes in your pants? Some questions were easier to answer than others. After years of drought we put in an extra water tank just in time for those drought breaking rains. Digging, grading and lining the pad for the tank was our first opportunity to get some blisters and all-of-body muscle cramping. Next came earthworks for a dam with swales to take water across the block — a lesson in taming water flows. We had a 50/50 chance the clay at the bottom of the hole would hold water…if it rained. When it did we learned that sinking a whole hay bale into the water is considerably more than required to encourage a mini ecosystem but just enough to become a maxi methane generator. Having dealt with water, we then got onto temperature. When you’re cold you can’t just turn on the heater and five minutes later be warm. When you’re not cold—months, actually years before you get cold—the switch you turn on is that of the chainsaw. The thing that can take a limb off in the blink of an eye has shifted from being the stuff of horror movies to just another tool in the shed. If the winters are cold, the summers were heat-stroking, especially in a house and sheds with no ventilation. Easy you think, except we are blessed with such enormous windows it took months (possibly years is more accurate) of thinking before flywire screen sliding doors and a massive eave extension materialised. And that’s the fun of living here. In between working out logistics you get to look around at the amazingly diverse plants and wildlife that we share this place with. What once looked like incredibly harsh, bare land comes alive with fungi and orchids, is traversed by echidnas and wallabies and is spun up in webs of gold by giant golden orb spiders. Who would want to be anywhere else. Twenty years ago when visiting those friends living in Castlemaine, we drove through Chewton and I remember thinking “I could never live here”! Can you believe it? This entry was posted	on Thursday, November 15th, 2012 at 12:18 pm	and filed under • Bushlanders, Our lot. You can follow any responses to this entry through the RSS 2.0 feed.